White-faced ibis in flight photographed at Frank Lake 300 mm F2.8 lens Nikon D300 The white-faced ibis is a wading bird in the ibis family. This species breeds colonially in marshes, usually nesting in bushes or low trees. Frank Lake is a restored wetland 6 Km east of High River and about 50 Km south of Calgary and 2 Km south of Blackie. The lake is controlled by Ducks Unlimited who manage the area and ensure the lake is a permanent body of water. In the past few decades water levels have varied greatly. There are two blinds on the lake that birders and photographers can visit to view and photograph birds. Many of the photos in this article were taken from the north blind. I have visited the Lake in all seasons. In winter I scout the surrounding roads for snowy owls. In Spring many birds use the area for staging and I have photographed hundreds of tundra swans on the frozen lake in spring. The roads into the lake are closed in winter of course but you can often photograph birds from highway 23. 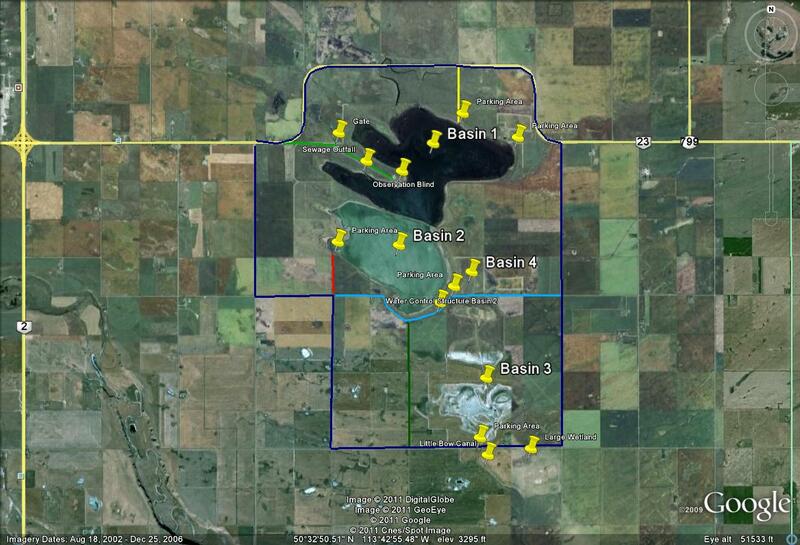 Frank Lake consists of 3100 acres (1010 ha) of wetlands and about 1,700 acres of surrounding managed upland. Most of the surrounding landscape is agriculture and pasture land. The primary inflow of water is from treated municipal and industrial wastewater via a pipeline, agriculture runoff from Mazeppa Creek and Blackie creek. The treated waste water is from High River and the nearby Cargill meat packing plant. The water quality at Frank lake is monitored by Alberta Government and was subject of a recent thesis at the University of Calgary (see ref below). The lake is located in the foothills fescue prairie region and plants around the wetland include hardstem bulrush, sago pond weed, Richardson's pond weed and northern watermilfoil. I recently went to Frank Lake to collect water samples to photograph microorganisms that lived in the lake - see my article on Photographing Water fleas. I always bring my camera equipment and while there I photographed a variety of birds around the edge of the lake and from the north blind. If you have an interest in birds and have never been to Frank lake this is a good place to check out. The lake is named after Bishop Christopher Frank who established a nearby Mormon settlement known as Frankburg. Acess the North blind from Highway 23, take Township Rd 190 and drive to the end - then it's a short walk. View from inside the blind at Frank Lake. It has benches, a poster with common birds you might see and the blind can handle about 20 birders or photographers. View out one of the blind windows at Frank Lake looks out over the marsh at numerous bullrushes. In front of the blind you look straight out to the lake where often birds swim into view. Eared Grebe and babies photographed from the blind. 500 mm F4 lens Nikon D500. Western grebe photographed from the Frank Lake blind. The Western grebe is the largest grebe in North America across the wings. It is black-and-white with a long slender, swan-like neck with red eyes. 500 mm F4 lens + 1.4X teleconverter, Nikon D500. American coot feeding young, photo taken from the blind 500 mm F4 lens Nikon D500. There is a barn swallow nest in front of the bird blind under the roof overhang - you will likely see the birds fly in an out of their nest while you are there. Ruddy Duck photographed in front of the blind. Normally they move their head up and down in a bopping fashion and are comical to watch. Killdeer a medium sized plover. If you approach its' nest the bird will often put on a display - the "broken wing" behaviour in order to try and lure you or a predator away from the nest. The black-crowned night-heron is a medium sized heron. We spotted three of them resting on fence posts in a pond adjacent to the highway close to Frank Lake. 500 mm F4, 1.4X teleconverter and Nikon D500. Black-crowned night heron. They have thick necks, large, flat heads, and heavy, pointed bills. The legs are short and, in flight, barely reach the end of the tail. The wings are broad and rounded (www.allaboutbirds.org). 500 mm F4 plus 1.4X teleconverter, Nikon D500 on monopod at ISO 2500 - it was getting dark when I took this picture. On the left is a Lesser Yellow-legs and on the right the larger bird is a Marbled godwit with a slightly upturned bill. In the foreground are several long-billed dowitchers which are medium sized shore birds. They have brick-red underparts dark upperparts. They also have a dark patch between the eye and bill. Probes the ground with "sewing-machine" motion for spiders, snails, worms, insects and seeds. Marbled Godwit photographed in early morning light in a pond next to the highway 23. Northern shoveler, female on the left and more colourful male on the right. American avocet is a large wader spending most of its time foraging in shallow water and mud flats sweeping it's bill from side to side, occasionally catching small fish. Black-necked stilt takes flight. These birds are abundant around the shoreline and also display the broken wing behaviour. The white-faced ibis is a wading bird that you can find around the shorelines of Frank Lake. White-faced ibis in flight Nikon 500 mm F4 lens, Nikon D500 camera. A variety of Gulls at Frank Lake; Franklin's gulls have the black heads, the other gulls are California gulls. Forster's tern hovering in the air - similar to Common tern but has lighter outer wing feathers and a longer tail (ID by Wayne Lynch). In March as the ice begins to melt the Tundra swans and other birds gather on the ice on Frank Lake waiting to head north. One hundred and ninety four birds species have been seen at Frank Lake, 190 plants and 16 mammals. If you live in Calgary or surrounding area, Frank lake is just a short drive and great place to see and photograph birds. The best times are in the morning and evening when the light is at an angle and the temperatures are cooler in summer. I recommend bringing a pair of rubber boots, insect repellent, snacks and some water with you. A pair of binoculars and camera with a telephoto lens if you are inclined to take pictures. I had the pleasure of visiting Frank Lake recently with birding experts Dr. Wayne Lynch and Dr. Sharif Galal.